North Myrtle beach is a beautiful and peaceful city located along a nine-mile stretch of the Atlantic Ocean coastline in South Carolina. The beautiful city was created in 1968 when four small beach towns—Cherry Grove, Ocean Drive, Crescent Beach, and Windy Hill Beach consolidated into one town. The fairly new city has developed into an exceedingly popular tourist hotspot because of its stunning, sandy beaches, enjoyable activities, and world-class attractions. Thousands of visitors vacation at North Myrtle Beach, especially in the summer, to have a relaxing and fun-filled vacation experience. Luxurious beach vacation homes are very popular among tourists because they make you feel as if you are at home away from home and you can thoroughly enjoy the real spirit of this city. 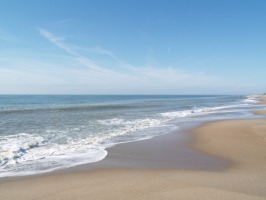 North Myrtle Beach is widely known for its superb beaches. Cherry Grove has scenic salt marshes that have colorful wildlife. By staying at a beach house, you can relax on your deck while watching the fascinating pelicans and egrets, or go to the fishing pier and catch your own dinner! Tilghman Beach is an old residential community that has many chic shops and restaurants. Ocean Drive Beach is a beautiful and exciting beach that is surrounded by many nightclubs. Be sure to bring dancing shoes and try the Shag which is the indigenous state dance! The beaches are ideal for relaxing, sunning, surfing, water skiing, kayaking, snorkeling. Fishing is a very popular activity in North Myrtle Beach and visitors can enjoy inshore, offshore, and surf fishing and find some of the largest and most unique fish in this city! North Myrtle Beach also offers party boat fishing, private charters, casino cruises, and riverboat cruises. In addition, North Myrtle Beach is a haven for golfers as the city has over 120 world-class golf courses that are designed by well-known architects. The Dunes Golf & Beach Club, located right off the beach, is the area’s most prestigious golf course, while the Barefoot Resort up the road features a collaborative design on its courses by some of the best players in the world – Dye, Fazio, Love III and Greg Norman. North Myrtle Beach is also a wonderful place for a family vacation—the city boasts numerous theme parks, aquariums, adventure parks, race tracks and miniature golf courses. The city also has a prominent culture of performing arts. Le Grand Cirque at the Palace Theatre is a mesmerizing performance features the globally acclaimed acrobatic and theatrical performers. The show is so spectacular and surreal it will leave you in amazement and wonder! North Myrtle Beach has a wide variety of fine restaurants that have diverse cuisines including Italian, Japanese, French, and classic American. Among the top to try – Villa Romana (Italian), Rioz Brazilian Steakhouse (Brazilian), Bonefish Grill (seafood), and Abuelo’s Mexican Food Embassy (Mexican). Whether you want to take a fun-filled family vacation or have a romantic getaway, you are sure to have a superb holiday at a luxurious beach vacation home in the beautiful North Myrtle Beach.